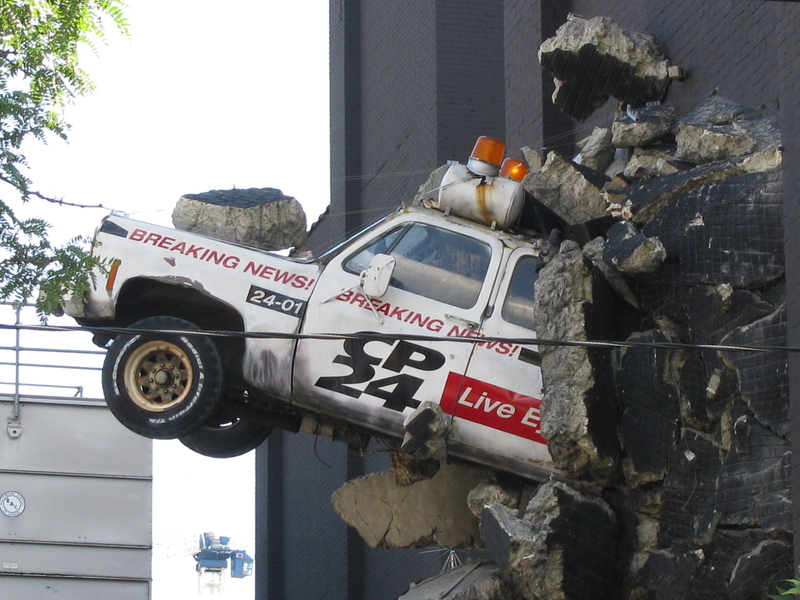 I saw this in Toronto, Canada and thought it was a clever ad for CP24, a news channel. This entry was posted in Blog, Blogging, North America, Travel, Travel Photos and tagged 50 Year Project, Blog, Blogging, Breaking News, Canada, Clever Ads, CP24, Life, North America, Photo, Photography, Toronto, Travel, Travel Blog, Travel Journal, Travel Photo. Bookmark the permalink. Wow! That is some breaking news!! It certainly is a very eye catching ad! For a moment there I thought it was genuinely real. I hope you do. I went during the summer. Not sure what it’s like in the winter. My guess: cold and snowy. It had me going for a while too. Definitely photo worthy. When I first saw it I thought it was real and I couldn’t figure out why no one else was looking at it. Hey, how come I’ve never seen that?!? LOL! You have to look up. I was there a few years ago, not sure if it’s still there. did I mention that I love Toronto? Fantastic town. That’s my hometown – I love it too :). Great photo. Well, after seeing it, I think that I must slow down my high speed of my car on German highways. Yes, be careful. Don’t become breaking news. I loved that aspect of Toronto. LOL – they created their own breaking news! Very clever and great shot. i saw the same kind of thing once travelling after a blizzard. a car must have taken flight, driving too fast, and ended up about 8 feet in the air, half in to a giant pile of snow that had been plowed from the road. i wondered it they had left it there, hoping people would get the message. Some people just don’t understand that they need to slow down, especially in bad conditions. I knew someone who insisted that since he had an SUV he could drive like normal in the snow. Then he wrecked his vehicle and learned a lesson. Fortunately no one was hurt and the damage was minor. That isn’t always the case.